Offering an unrivalled snapshot of Tanzania’s Southern Circuit, this 10-night trip combines three of Selous Safari Company camps: an incomparable wildlife experience at two contrasting safari destinations with your final port of call being our blissful beach lodge south of Dar es Salaam. Relaxation is the keynote to Ras Kutani with a selection of activities including spa, snorkelling a shipwreck, boogie boards, kayaking, walks and watching turtles hatching. After transferring to the domestic terminal, you’ll connect with your 8.30am flight to Ruaha National Park which will traverse the breadth of Tanzania.  With a flying time of just 2.5 hours, on arrival at the airstrip, which is used exclusively for our guests, you’ll be greeted by your guide and driven the short distance to Jongomero where a traditional communal safari lunch awaits. Under a dappled riverine canopy, this secluded sanctuary is positioned on the banks of a dry riverbed which is a natural pathway for animals in search of water and is the most splendid spot to experience the region’s extraordinary diversity of animals, birds and plants. 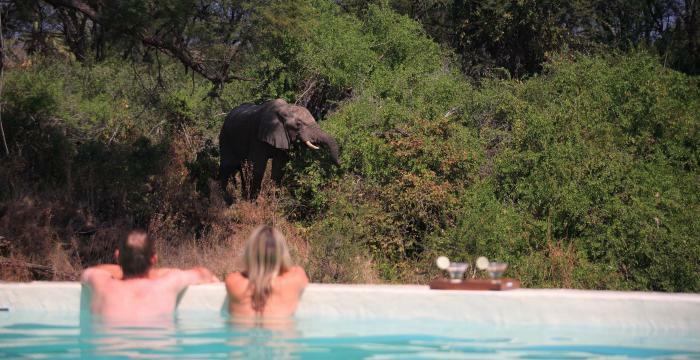 Having set the tone for your trip by spending time relaxing by our swimming pool, you’ll enjoy a delicious afternoon tea before setting off on your first game drive. Epitomising ‘wild Africa’ in its most rugged, glorious form, you’ll explore Ruaha’s undulating landscape which is home to giant baobabs and the Park’s rich variety of elephant, buffalo, giraffe, zebra, impala, eland, hippo, crocodile, lion and leopard. Each evening over drinks, you'll have the chance to discuss your plans for the next day with our managers. Whether you chose to explore by vehicle or on foot, our expert guides will ensure you enjoy the wealth of biodiversity Ruaha has to offer. Game drives around Jongomero are unique and cater for the safari connoisseur; our remote location situated more than 70km from the next nearest camp means we don’t share our game viewing with any other guests or vehicles. Alternatively we offer a dawn game walk during the dry season. With the African sun warming your back, you’ll navigate the parched riverbeds while your guide tells you fascinating, often bizarre stories, about the local flora, fauna, insects, birds and animals. For a truly authentic African adventure, Jongomero also offers a fly- camping safari in the mighty Ruaha (min 3 night stay at Jongo). Arriving at the exclusive wilderness camp either by road or by foot, you’ll settle in with hot bucket showers before meeting around the camp fire for a sundowner. After a tasty bush dinner, sleep beckons under the dome of a star gazer tent. 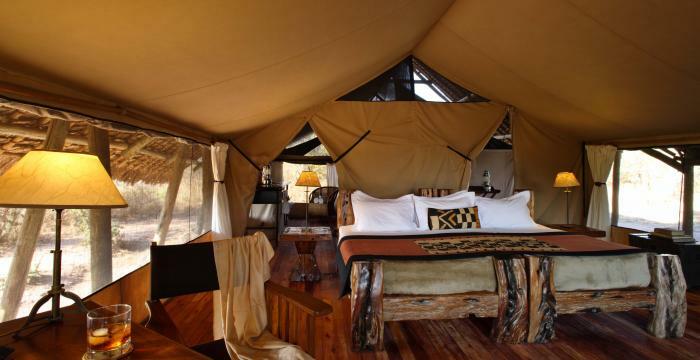 You’ll return to the luxury of main camp the next morning ready to share your bush tales. 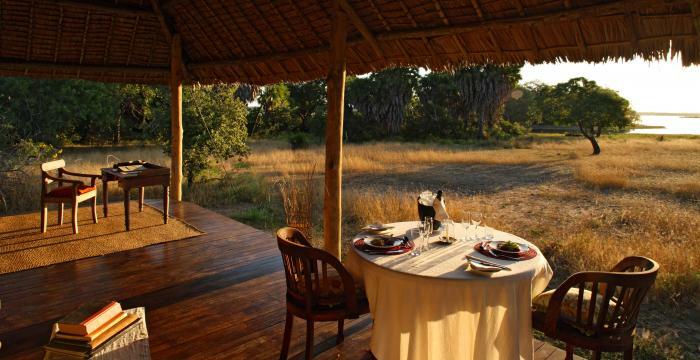 You’ll depart Ruaha after breakfast for your flight to Selous Game Reserve, the largest in Africa. Boasting UNESCO World Heritage Site status for very good reason; Selous Game Reserve is home to the most exceptional and diverse wildlife, with more than half of Tanzania’s elephant population, over 40,000 hippos and the largest population of lion on the continent. An easy transfer from the airstrip, Siwandu camp is located in a grove of palms on the shore of Lake Nzerakera. 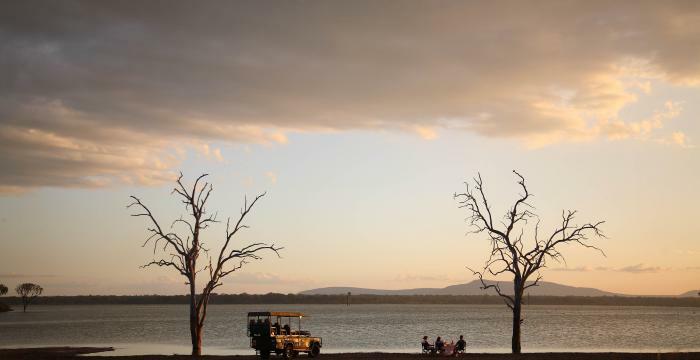 As well as ensuring a stunning backdrop for the camp, this lakeshore location offers jaw- dropping game viewing with a great number of animals gravitating around the lake. It’s also the only place in East Africa where you can experience water-based game activities. With the orientation briefing out of the way, you’ll have time to settle into your tented suite overlooking the lake. A two-course lunch on the Pontoon boat will be your first taste of Siwandu’s delicious food which will be accompanied by the chance to spot the hippos and crocodile drifting past you. Afternoon tea will give you the opportunity to meet and share freshly baked cake with your fellow safari before embarking on your first game activity. Returning to camp having experienced the local bush life, you will enjoy drinks around the campfire and a tasty three-course dinner under a canopy of stars. After a peaceful night’s sleep with the noises of the bush just beyond your canvas, you’ll start your day with early morning tea or coffee and freshly baked biscuits delivered to your tent by your personal butler. At Siwandu, game drives tend to follow a hearty breakfast giving the animals time to gravitate towards the lake. This ensures a far denser concentration of game around the camp. Siwandu offers a brilliant range of game activities for its guests. Climb on board one of our open sided 4WDs to explore the landscape and enjoy tales of wild encounters that your expert guide will share with you. If a leisurely boat cruise is more your thing, you can take to the water and wend your way along the the Rufiji River tributaries; venture close and see the animals from a different perspective while you learn more about the fascinating life of water birds and our wonderful populations of hippo and crocodile. Or set your clock to experience the thrill of a dawn game walk and have the opportunity to track animals and engage with the smaller habitats and ecosystems. Don’t be daunted by the early start, there’s plenty of time to make up for it later by the pool, the perfect place to relax and enjoy a mid-afternoon snooze. For guests younger than 16, who cannot take part in our main walk, we offer a fun, fact-filled children’s walk around our camp footprint. 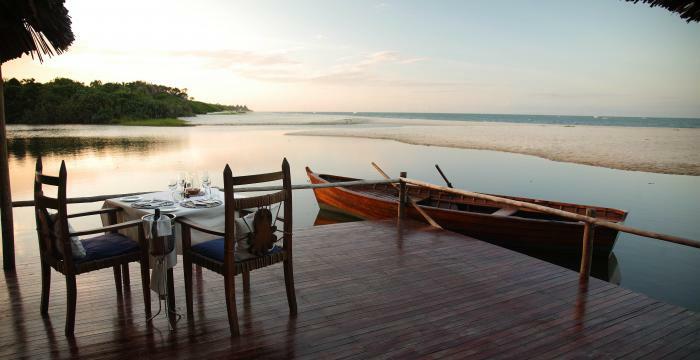 From the majesty of the bush you’ll be whisked away to the castaway paradise of the Indian Ocean. This morning you’ll wave goodbye to the great Maasai giraffe and the other plains’ game on your final game drive to the airstrip, as you fly either direct to Ras Kutani (with Safari Airlink) or return to Dar es Salaam. From here you’ll be met by a driver who will be your guide on the fascinating 1.5 hour road journey through market towns to the haven of Ras Kutani, 25 km south of Dar es Salaam. 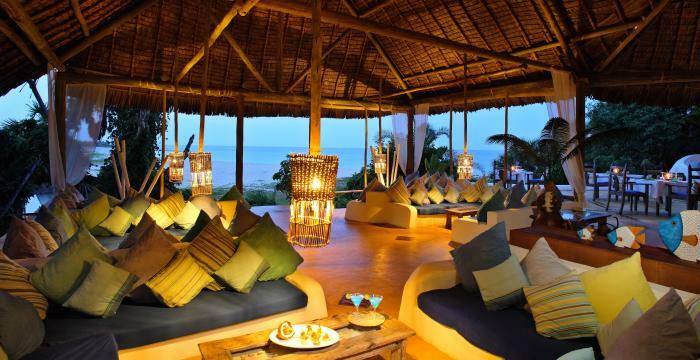 Ras Kutani is set in an idyllic position on the shores of the Indian Ocean with white sand beaches stretching as far as the eye can see. Checking into one of the nine beachside cottages or one of the large, beautifully light and airy hillside suites (ideal for honeymoon couples or small families), is your cue to kick back. Settled in your home from home for the next few days, cast your khakis and shoes aside and with the sand between your toes, relax into the beach’s unique pace of life with BBQ lunches, sunset cocktails and delicious private dinners. Wake up to the glowing sunrise and the chatter of monkeys in the trees which cocoon your room. Ras Kutani is located on the shores of the Indian Ocean and lies next to a fresh water lagoon with a backdrop of a virgin coastal forest. With these incredible surroundings, this location will ensure you are fully immersed in the purity and beauty of the natural world. Ras Kutani’s keynote is relaxation. A sanctuary away from the hustle and bustle of every day life, there’s no better place to switch off and unwind. In addition to languishing poolside, if you want to drag yourself away from your sun lounger, there are a host of other activities for you to enjoy. Whether you choose to opt for some pampering with a tranquil spa treatment and explore the local village or prefer something more active like snorkelling among the shipwrecks, boogie boarding or kayaking on the lagoon, there is more than enough to ensure your stay at Ras Kutani will be a memorable one. For those visiting during the months of June, July and August, we are lucky enough to host turtles who lay their nests along the beach giving guests the opportunity to watch hatchlings. On your final day, with your bags packed you can enjoy your last few hours of tropical sunshine before transferring back to Dar es Salaam either by road or air to meet your international flight back home – Bon Voyage and Karibu Tena!